From ocean-going robots to virtual reconstructions of ancient cities, new tools and techniques are transforming archaeology like never before. From radiocarbon dating in the 1940s to remote sensing techniques in the 1960s, archaeologists have long been early adopters of futuristic technologies — and this is still true. Drawing on the expertise of many scientific disciplines, archaeologists today are harnessing a range of sophisticated devices and techniques to gain exciting new insights about the ancient world. "Archaeology has always been very interdisciplinary," says Heather Richards-Rissetto, an archaeologist at the University of Nebraska-Lincoln. "But I think now there's a lot more collaboration between science and engineering than before, and archaeologists are a part of that, helping to develop the technologies to study the past." The tech-enabled discoveries include some pretty amazing ones. 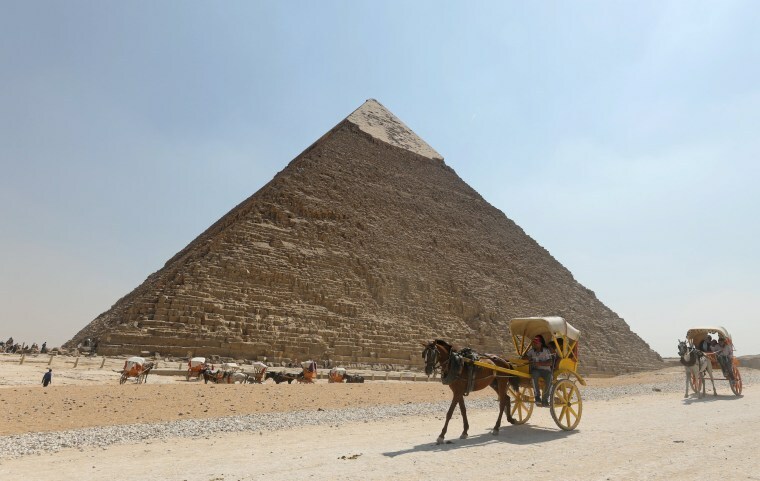 For example, researchers seem to be on the verge of finding hidden chambers deep within the 4,500-year-old Great Pyramid of Giza, thanks to a new scanning technology that measures subatomic particles passing through the pyramid (the technique isn’t too different from the way doctors use X-rays to image our bones). Other examples of high-tech archaeology include ocean-going robots that can explore submerged ancient cities; complex mathematical techniques for recreating the sounds of daily life in ancient times; VR technology to turn dusty ruins into living, breathing virtual communities; protein analysis techniques that reveal what diseases Incan mummies harbored in life; and imaging technologies that reveal the true colors of ancient statues. For decades, archaeologists have relied on geographic information systems (GIS), a discipline that uses GPS and other data to create sophisticated two-dimensional maps of structures and artifacts within archaeological sites. But Richards-Rissetto and other scientists have begun linking GIS to 3D modeling techniques for a much more detailed look at lost worlds. One result of the new approach is a detailed computer simulation of the ancient Mayan site of Copán in Honduras, which can be walked through and explored with a VR system like Oculus Rift or Unity. Creating this kind of interactive virtual world wouldn't be possible without a pair of state-of-the-art imaging technologies: LiDAR (for "light detection and ranging") and photogrammetry. LiDAR is a bit like sonar, only it generates spatial information using light instead of sound. Mounted on helicopters or small planes, LiDAR devices calculate the distance to objects on the ground by measuring the time it takes for a reflected laser pulse to return to the device. LiDAR allows archaeologists to quickly map a site’s topography, including areas deeply buried under dense forest canopies. LiDAR has even enabled scientists to find “lost” cities, such as the "White City" in the Mosquitia region of Honduras. "We're finding that there is so much more out there in general that we didn't know about it," Richards-Rissetto says. Air- and ground-based photogrammetry, meanwhile, helps fill in the details. It turns a series of two-dimensional photos into three dimensions, allowing researchers to create high-resolution models of ancient structures and artifacts. The resulting models can be pulled into a virtual reality system, where textures, colors, lighting and shadows, and vegetation are added to yield unparalleled realism and drama. Richards-Rissetto is using VR to show what Copán would have looked like at the height of Maya culture in the 5th to 9th Centuries A.D. — for example, what the king would have seen when he looked out over the city from his perch at the royal acropolis. "[Archaeologists] fit well into this cyber realm," Richards-Rissetto says. "It allows us to ask questions and do things with the data and technology that's not normally done." If some archaeologists are focusing on what ancient people saw, others want to know what they heard. "A lot of the stuff that researchers have been doing has been about visibility and line-of-sight," says SUNY archaeologist David Witt. "They've been asking questions about whether the great houses could be viewed by other houses or the local community. But could these buildings have been placed where they are for auditory purposes?" Witt and his colleague Kristy Primeau, an archaeologist at SUNY Albany, used LiDAR data and GIS tools to determine how sound from would have propagated (taking into account variables like humidity and air temperature). Their work showed, among other things, that a person standing at one great house could hear another person addressing a group at another great house some 500 feet away. And if a conch shell was blown near Casa Rinconada (a large ceremonial structure in the canyon) at dawn on the summer solstice? The research showed that the sound would have carried throughout the canyon, even reaching the shrines atop certain mesas. But the sound wouldn’t have carried to the shrines if their locations were only slightly different. "We're finding that there are places on the periphery that would've been able to hear the sounds," Primeau says. "It doesn't necessarily mean they were put it there for acoustic purposes, but it was neat that these places were right on the auditory edge." Richards-Rissetto wants to bring acoustic analysis into her virtual world, allowing her to determine, say, if ceremonies within buildings could be heard by people walking through the city. "It would suggest a level of secrecy and power," she says. "You're aware of something but you can't see it." Acoustic research is key to underwater as well as terrestrial archaeology, but for a different reason: It helps researchers find ancient shipwrecks and submerged cities. Sonar has been a vital tool for decades, but recent enhancements make it far more powerful. Now it can be used to obtain high-resolution images of distant objects (previously sonar could show the location of distant objects, but researchers had to get close for a good look). "Now you get a combination of great range and high fidelity in one package," says Brendan Foley, an underwater archaeologist at Lund University in Sweden. What's more, Foley adds, sonar placed aboard autonomous underwater vehicles (UAVs) can locate underwater objects more efficiently than sonar deployed in surface vessels. And combining sonar with underwater LiDAR and photogrammetry means UAVs can give researchers detailed 3D maps of the seafloor and anything on it, such as submerged ships. The artifacts can then be integrated into a model that shows how a particular shipwreck might have occurred. Advances in scuba diving equipment have also made underwater excavations of much easier. Using conventional scuba gear, archaeologists are able to survey sites dozens of meters down for just a few minutes. But in recent years, so-called “rebreather” systems — which remove carbon dioxide while adding oxygen — have enabled Foley and other underwater archaeologists to stay underwater for hours at a time. This full-body device allows divers to descend to 1,000 feet for up to 50 hours. It delivers breathable air at atmospheric pressure, so no post-dive decompression is necessary, and it features lights and thrusters for moving around easily, as well as communications gear that let the diver communicate in real time with colleagues on the surface. Of course, analysis of artifacts underwater is limited no matter what diving gear is being used. But back on land, marine archaeologists have new tools to scrutinize collected samples that have been greatly degraded by the sea. Foley is particularly excited about DNA extraction and amplification techniques, which make it possible to identify biological material from tiny bits of DNA. Using these techniques, Foley is studying ceramic jars known as amphoras from a 2,400-year-old shipwreck off the Greek island of Chios. The jars are typically empty, but DNA fragments scraped from their inner walls show that some once held olive oil and oregano, while others held a plant resin commonly added to wine in ancient times. "It may sound dull, but what we're really doing is getting hard data of what the first economies were built on and what kinds of commodities were being traded," Foley says. This story was originally published on NBC News MACH on August 16, 2017.